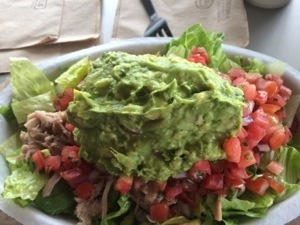 • There aren’t a whole lot of “quick” Whole30 options, but thankfully Chipotle is one of them. Granted, my lunch only vaguely resembles my normal meal (salad with carnitas, guac, and extra pico vs. chicken bowl with rice, veggies, pico, corn, and cheese), but it’s still delicious, just in a different way. Fresher and not as rich, maybe? 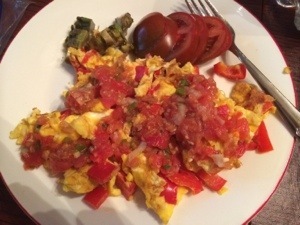 • I have had scrambled eggs for 15 days in a row, and I’m nowhere near getting sick of them. Special thanks to co-worker Linda for homemade Whole30-compliant salsa, which is delicious on them. • I have eaten more avocados in the past 15 days than probably in my whole life combined. The one pictured above is pretty sad-looking. • We are selling a bunch of stuff at a yard sale tomorrow. One of Chris’ aunts lives in an area that is having a community yard sale, and she kindly agreed to let us set up a table. Unfortunately, I got the dates mixed up in my head and thought it was next weekend, so I’m not as prepared as I would like. But I never am because I have impossibly high prep standards. • I have never had a yard sale. This should be interesting. • I had to go shopping for food to bring with us because her aunt very kindly agreed to let us spend the night. We don’t want to get caught with our Whole30 pants down. • Therefore, I will be breaking my scrambled-egg run. Egg “muffins” with sausage from our meat CSA will stand in. They are a worthy sub. • Gay-marriage decision any day now, PA. Any. Day. • Got to see Chris a little bit extra last night and this morning, so that was nice. Off to work. Ready for the end of the day! We have some pricing to do! i love avocados! and yard sales! and you!